I have a Scandanavian name and, for most of my life, my hair has been blonde (now going grey), so often people ask whether I have any family here in Denmark. The answer is no, my origins are Australasian (Aussie and Kiwi). Where I come from the land is more red and yellow, not green; the water is warm, not freezing; there are sharks and stingers (jellyfish) in the water; there are no thick peat (gyttja) deposits, it’s mostly carbonate; and there are no known submerged prehistoric marine archaeological sites. Therein lies the reason we are here. We are here to excavate the only known submerged prehistoric midden site in the world, and learn how we might apply such knowledge in an Australian context. As if that isn’t daunting enough, getting into the 15°C water. Not helping are the unseasonably cold and windy conditions – the spirit is willing, but the flesh is weak. In the first snorkel over the site, during a brief window of sunshine, we see flint artefacts everywhere! Perhaps not surprising given we have already observed numerous flint artefacts just washed up on the shoreline. Our Danish colleague, Peter Moe Astrup, swims up to me holding a bit of a wooden handle that he has just found – probably hazel he says. A few minutes later he shows me a worked reindeer bone, showing an edge on which an axe head was hafted. On another day, Peter picks up a bit of an early Ertebolle (c. 6.8 – 6.4 ky BP) ceramic – made from a mix of granite and the glacial marine clay over which the midden site has accumulated. It’s almost ridiculous but, then again, people have been researching submerged Mesolithic settlements in Denmark for over 40 years. We are mere novices in Australia. As we dive and begin to excavate the midden site itself, we observe a dense layer of large, flat oyster shells, with patches of black charcoal and ash – a hearth. I’m having to rethink how I’m going to get an undisturbed profile or sample any sediments under water. It’s all new territory and we are all learning as we go. I am constantly aware of the privilege we have here, but all the time wishing it could just be a little bit warmer! Dr Ingrid Ward is a geoarchaeologist. She is also a trained commercial diver and experienced Australian archaeologist now focused on the submerged continental shelf. Ingrid is the dedicated DHSC Postdoctoral Researcher and will work on both European and Australian components of the project. From time-to-time, our Project Blog will feature guest posts from specific team members or project partners. Our first of such posts comes from Professor Geoff Bailey of the University of York (UK) and Flinders University of South Australia (and the senior member of the DHSC project leadership). For someone who has spent half a lifetime looking at shell middens and shell mounds in many parts of the world, and in recent years has attempted to find underwater examples offshore of known shell mounds on land, so far without success, this week on the Danish island of Hjarnø has introduced me to my first experience of a genuine submerged shell midden deposit. The first sign of the underwater midden from land is an intertidal zone exposed at low tide and littered with flint artefacts and shells. The location is close inshore in shallow water on the edge of a channel, between the island and the mainland just 600 m away. This is exactly the sort of location expected according to Anders Fischer’s fishing site model. The sceptic in me wonders if the intertidal material has been eroded downslope from a mound that once stood on the ridge behind the modern beach. My Danish archaeological colleague Peter Moe Astrup, who first excavated the site seven years ago, assures me that this is material from the surface of a submerged midden just 20 metres further out under water. Some of this shell deposit is protected under a layer of peat and sand, but some has become exposed. It is material from here that has been gently washed ashore by tidal currents. Since the excavation of the submerged shell midden revealed an in situ hearth in the shell deposit, and bones of fish and land mammals and artefacts of flint, bone and antler typical of the classic Ertebølle, I am persuaded that the underwater deposit must be a pre-inundation in situ deposit. The site itself is some 20 metres further out in shallow water scarcely more than a metre deep, so it is quite easy to inspect the surface of the site visible on the seabed. The shell midden layer shows large oysters, cockles and mussels, typical of shells collected for food, shell fragments and a dense litter of flint artefacts, mostly with fresh and unpatinated surfaces. But here’s another surprise. There are also large numbers of large shells of species not present in the prehistoric midden – razor shells and a species of large, thin-shelled clam. Moreover, some of the cockle shells are clearly of modern animals. This becomes apparent when I pick up a large cockle with the pair of valves intact and shut – not unknown in archaeological middens – only to find, after prising the valves apart, a live animal inside. So, the surface of the ancient midden is a mixture of modern and ancient shells from very different periods of time – in short, our familiar friend a palimpsest. Telling the modern shells that have died naturally from the prehistoric ones collected as food is not at all easy, and would be even less so when coming across a shell deposit elsewhere on the seabed with no prior knowledge. The gjytta layers are even more interesting. Peter points out a half-buried antler axe, fishes up a neatly cut segment of round hazel wood, and casually asks me to watch out for a sandbag that is protecting a partly emerged wooden log boat. What wouldn’t I give to find evidence like this in any of the other parts of the world where I have worked? Yet here in Denmark it is a struggle to get sufficient funding to do justice to the recovery of this remarkable material. Another first for me is that I was persuaded to don a dry suit to go into the water and take a closer look. For the uninitiated like me, a wet suit lets some water through to keep a thin layer of warming water against the skin. A dry suit keeps you and your underclothes completely dry, or at any rate it is supposed to. Since I’m borrowing somebody else’s dry suit, I discover that I’ll have to take off some of my ordinary day clothes to struggle inside this rubbery ‘onesie’ garment, immediately risking the sacrifice of warmth for access. This is Denmark in early summer, much like home in England – cold, wet and windy most of the time with occasional spells of blue sky and bursts of sun. The rubber seal at the holds my throat in a near strangulating grip. I am given a safety brief on how to recover if I fall underwater and all the buoyant air in the suit goes to the feet. Not for the first time, I wonder what I am letting myself in for in taking part in an underwater archaeological project. Once in the water and submerged up to my chest, I hold a stake attached to a guideline for the best part of an hour while John McCarthy holds the other end 50 m away and keeps an eye on my progress. Jonathan Benjamin swims over the seabed with a snorkel and a camera to create a map of the seabed surface. I find myself continuously fighting to keep my footing against the power of the waves and the wind as I move the stake to the next point on the grid. But I know, as a conventional land-based archaeologist, that I cannot begin to understand what is involved in underwater work without participating in this way. Much of the first few days have been like any other field project – trying out equipment to discover what’s missing or doesn’t work, adapting to local conditions, and working out by trial and error the best way to do things. For an underwater project, these uncertainties are amplified by the added logistical complexities associated with boats, underwater equipment and the vagaries of changing weather, tidal currents, wind and waves. A first spell of survey with a sidescan sonar on a small boat is aborted because the rain sets in and the laptop supplied with the equipment is not a waterproof model, the battery charger on one of the underwater video cameras is playing up, and a first attempt at underwater video photography over the site area has to be abandoned because of poor visibility. The drone has been damaged in transit and needs to be looked at by the nearest service agent. Civilisation in the form of wifi and other vital supplies lies on the mainland a short ferry-ride away. Next day we try again but have to wait for the tide to change. Much time is spent standing around waiting for conditions to improve, but the time is not entirely wasted – we talk about the finer points of archaeological modelling and the purpose of archaeological theory. Later in the day we get a parking ticket on a shopping trip to the nearest town because we couldn’t read the regulations in Danish, and one of the rooms where we are staying has sprung a leak in the ceiling after a burst of heavy rain. By day three, things are beginning to settle down, some sort of daily rhythm is becoming established, new data is coming in and getting processed, and everyone in our small team is getting on with a sense of purpose with what needs to be done. The moral of this short saga is a familiar one for anyone used to archaeological fieldwork in unfamiliar locations. Expect that anything that can go wrong will go wrong. Be prepared. And above all be patient! Professor Geoff Bailey is Anniversary Professor of Archaeology (Emeritus) at the University of York, UK and a Senior Research Fellow at Flinders University, South Australia. He is an expert in human exploitation of shellfish, coastal prehistory and the archaeology of submerged landscapes. He also cooks a mean chicken curry. Three main excavation squares within Boodie Cave. 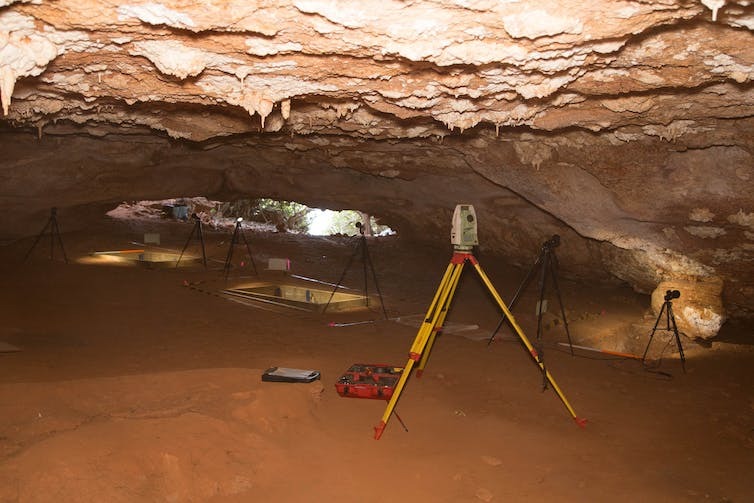 Archaeological excavations in a remote island cave off northwest Australia reveal incredible details of the early use by people of the continent’s now-submerged coast. PhD student Fiona Hook at the Boodie Cave excavation. Project leader Peter Veth discusses the significance of the Boodie Cave discoveries. The cave contains one of Australia’s longest dietary records. These animal remains provide us with profound insights into what people were hunting and collecting from initial settlement onwards, and how they adapted to a new and ever-changing arid landscape. PhD students Jane Skippington and Kane Ditchfield sorting material excavated from Boodie Cave. 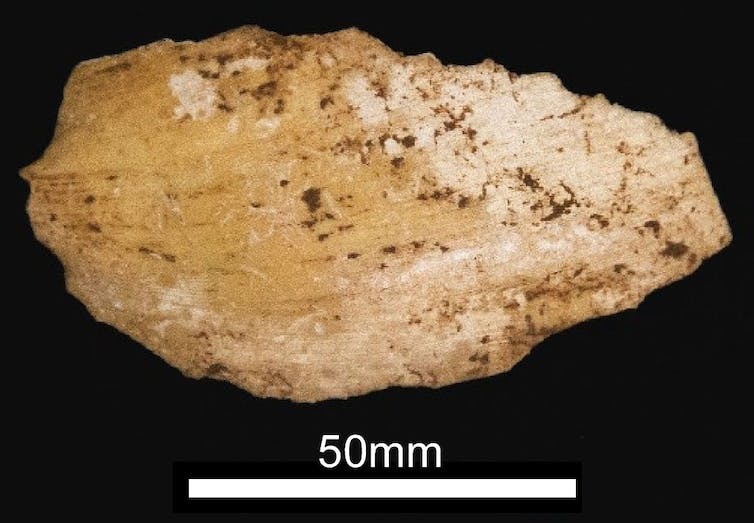 Marine shell dating up to 40,000 years ago was excavated from Boodie Cave, including this baler shell artefact dating to around 6,800 years ago. Boodie Cave is located on the second bluff in the centre of the photograph. But the coasts along which the earliest Australians traversed were very different to today’s, not only in terms of ecology but also in distance. In some places the earlier coastline would have been hundreds of kilometres from its present position. Peter Veth (left) with Thalanyi elders Anne Hayes, Roslyn Davison and Jane Hyland at Boodie Cave on Barrow Island. Lead archaeologist Peter Veth excavating a rich layer of dietary remains and artefacts below the surface of Boodie Cave. Nearly one-third of Australia’s landmass was drowned after the last ice age and along with it evidence for coastal use by some of the earliest Australians.